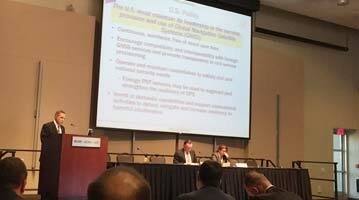 U.S. government officials delivered the following presentations about GPS during the Tenth Meeting of the International Committee on GNSS (ICG-10), held November 2-5, 2015, in Boulder, Colorado. This presentation provides a review of the U.S. GPS policy and management structure, plus an update on complementary PNT. This presentation provides an update on the status of the GPS constellation, performance, and modernization. This presentation provides updates on the WAAS program and the partial decommissioning of the NDGPS network.